fire, then have ready some thick gravie sauce as for a raggooe with paletts sweet [illegible] & morells in it, which must all be boiled tender before thay'r put in, will be ready in a bout 2 hours, then dish it & poure on the sause garnish with lemon & pickles. Pike Sause [G?] 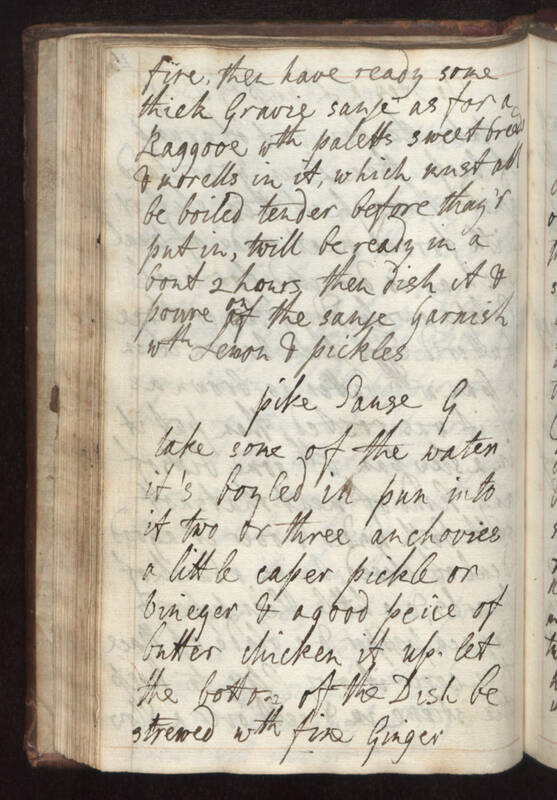 take some of the water it's boyled in pun into it two or three anchovies a little caper pickle or vineger & a good peice of butter thicken it up. Let the bottom of the dish be strewed with fine ginger.